Darryl Johnson’s journey began on Flint’s northside and we went on to attend Flint Central High School where he excelled on the basketball ball court. In 1983 he helped lead Flint Central to their third straight Class A State Championship. Johnson’s talents on and off the court led him to Michigan State University where he was a standout student athlete from 1983-1987. While at MSU Darryl played the guard position for legendary coach Jud Heathcoate. In his junior season the Spartans finished with a record of 23–8 and made it all the way to the “Sweet Sixteen” in the NCAA Tournament. One of his best performances came in a televised game against Minnesota where he scored 31 points. Darryl would go on to earn All-Big Ten honors in his senior season. In Darryl Johnson’s career at Michigan State he started in 64 games for the Spartans with a career total of 1383 points, 289 assists, 258 rebounds and 138 steals. Darryl is one of only 50 players who have scored over one thousand career points in the history of Michigan State Basketball. Darryl led the Michigan State Spartans in scoring in the 1986-87 season which gained the attention of the NBA and the Golden State Warriors. In 1987 the Golden State Warriors selected Johnson in the 3rd Round of the NBA Draft. Darryl Johnson spent the early part of his professional basketball career playing in the Continental Basketball Association and the World Basketball League. In 1991 Darryl won a WBL Championship with the Dayton Wings and in 1993 was named to the Canadian NBL All-League Team. 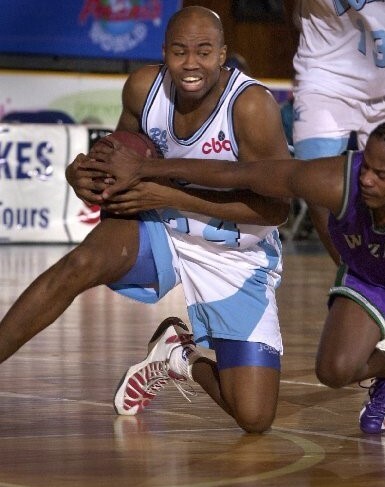 Johnson’s professional basketball career lasted over 15 years included a stint in the NBA with the Cleveland Cavaliers and a season with the Flint Fuze. Darryl Johnson you are the true definition of being “Flint Strong”! You have made Flint proud. Welcome to the Greater Flint African American Sports Hall of Fame!